One of the most common Mac OS X requests I hear—from both long-time Mac users and people new to the Mac—is for ways to get more flexibility and power from the Finder. One option is to replace the Finder completely using a utility such as Path Finder. But another is to tweak the Finder using Binary Age’s TotalFinder, currently available in a public alpha (pre-pre-release) version. TotalFinder’s biggest tweak is that it gives Finder windows Web browser-like tabs, allowing you to view the contents of multiple folders within a single Finder window. These tabs—which look more like the ones in Google’s Chrome browser than those in Apple’s Safari—work similarly to those in your Web browser: you can drag a tab to the left or right to change its location among other tabs; you can drag a tab down to separate it from the tab bar and create a new window; and you can drag tabs between windows. These tabs also support Mac OS X’s “spring-loaded” feature for folders and windows. If you drag a file or folder onto a tab in a Finder window, that tab is brought to the front, allowing you to drop the item into the folder represented by that tab. This feature ends up being quite convenient with tabbed Finder windows, as it lets you move and copy files between different tabs in the same window. A number of other useful options are available via a new screen in the Finder’s own preferences. For example, you can enable a quick-access Finder window that pops up from the bottom of the screen whenever you press a keyboard shortcut. 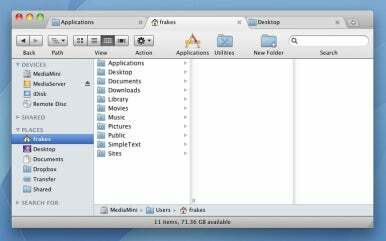 You can also opt to prevent .DS_Store files from being created in folders; show hidden files (an option also available from the Finder’s View menu with TotalFinder installed); sort folders above files in List view; and force the green Zoom button to always maximize Finder windows to fill the screen. As alpha software, TotalFinder is obviously not polished. I found the current alpha to be fairly buggy, with most of the issues I encountered relating to the display of windows and tabs. (It was especially problematic when used on a Mac with multiple displays.) But for those who generally like the Finder but just want to cut down on window clutter, an official release of TotalFinder is something to look forward to.